Happy Mother’s Day from SFC! In honor of Mother’s Day, we’d like you to meet one of our mothers in our pantry program, Marta. 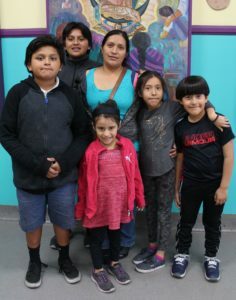 Marta, one of our guests in case management, is a mother of six children, living in the low-income neighborhoods surrounding St. Francis Center. A survivor of domestic violence, she is raising her children on her own. She has a five, six, nine, eleven, thirteen, and fifteen year old, and finds her home can be very hectic at times. She had been struggling to pay her bills due to her hours being cut at work, so a friend told her about SFC’s services, and she came to the center, seeking financial help. Working with our Resource Specialist, Thalia, SFC has helped Marta get back on her feet. She is enrolled in our case management services, and has been able to keep her apartment. “My hope for the future is that my children will become successful professionals in their fields when they grow up so they can live good lives, free from financial troubles,” said Marta, who works hard to provide for her children, and does her best to motivate them to stay in school, so they won’t have to take low-paying jobs just to make ends meet. Marta has been working with Thalia in case management and attending financial literary workshops to learn how to manage her money and save for emergency situations. She is now a guest of our pantry services, and was eligible to receive gifts this past Christmas. Her family also regularly attends the center’s movie and game nights, and she comes to volunteer at the center during her free time. It was important for her to give back to a place that has helped her and her family tremendously. She also brings her older kids with her on occasion so they too can give back and witness first-hand everything SFC does for the community! This Mother’s Day, will you help us provide food and stability for mothers like Marta and their families by making a donation? A tribute donation to SFC is a great way to honor your mother as well! 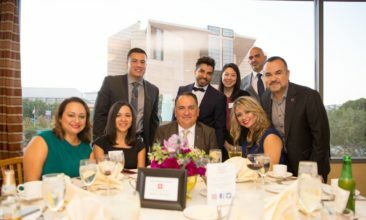 SFC Honors Our Mothers Through Special Event! 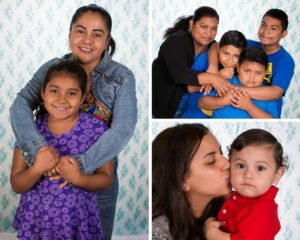 For St. Francis Center’s fourth-annual Mother’s Day event, volunteer and photographer Javi de Leon has generously offered to do free photoshoot sittings for our mothers with their families at St. Francis Center on May 5. Mothers will then receive their 8×10 photo during their Pantry Service visit Saturday before Mother’s Day. Your donation this spring will not only help provide our extremely low-income families with fresh, nutritious groceries, but also will help support our special Mother’s Day event!